Chapter Three: The visit to "Blacklions" Strike Fighter Squadron and the interview with their Commander. 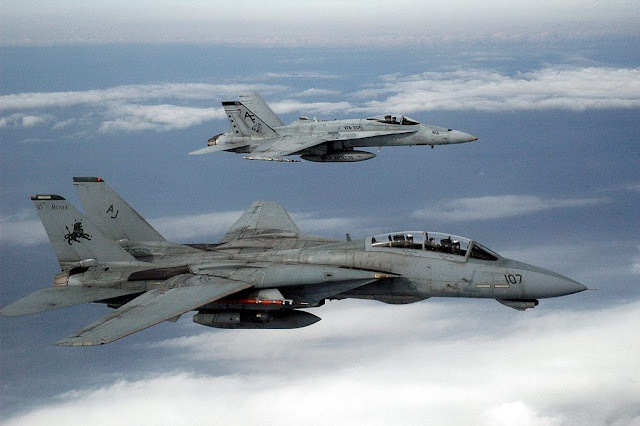 An F-14D Tomcat assigned to "Blacklions" flies in formation with an F/A-18A+ Hornet assigned to "River Rattlers"
After our sunset visit to the flight deck to take suggestive pictures, we went to the dining room and during the way we noticed red lights all around us. “This color allows the ship to be less visible to the enemy. The red light is less visible than the classic white light. For the same reason, the flight deck operators use blue lights”, a PAO said. Our first day ended with the accommodation in the cabins, inside there were bunk beds, towels, water and courtesy snacks, beautycase, two desks and two lockers. During the night we slept little, not because of the screen that showed all that happened on the deck, but due to the noise of the takeoffs and landings without stop for whole night. It seemed to have them above the head (and so it was), but during sleep, that noise sounded like a shot of a cannon, “After a while we do not hear it anymore” a sailor said. Next morning we wake up early to have the opportunity to admire the activities during sunrise: the light was perfect and the atmosphere less polluted by the gases than the rest of the day. After breakfast we visited one of the Strike Fighter Squadrons’ room while the pilots were preparing for the flights. We entered in the “Blacklions’ Territory” and we was struck by high volume rock music and semicircular chair files. On the left there was the organizational area that included a board to mark the pilots' activities and to the right a coffee corner, while in front of us.... “Iceman”! We thought of a suggestion caused by the place, but in front of us there was a billboard with a series of callsigns followed by colorful coins and that nickname was in the list. "The board shows the perfect landings (green coins), not perfect landings (yellow coins), misses landings (black coins), and the wrong ones for causes of force majeure (white coins)", a pilot said. The best one was the Squadron Commander Kevin Robb, the officer I interviewed. Thanks for the opportunity you offered us. You flew F-14 and F-18, what of the two do you emotionally prefer? No doubt F-14: It was the first plane of this type. Technically, the F-18 is more advanced and improved, but if I have to talk with my heart, I prefer F-14. Soon you will receive the first F-35. Do you think it will be difficult for pilots to switch from F-18 to F-35? Do you think it was more difficult to switch from F-14 to F-18 or will it be more complicated from F-18 to F-35? This is a good question ... Definitely from F-14 to F-18 for the difference of electronics and power. What's the hardest thing for a pilot excluding takeoff with catapult and landing with hook? Well, I think for sure to be always responsive to the communications received: we must immediately understand what is being ordered and do it, in any flight conditions. Has "your pilot" ever been hostage by the enemy? No, fortunately no. We have always come back after the missions. Working far away my family. I've been doing this job for 23 years, 6 years ago I started to be embarked on a carrier for periods of five months per time and staying away from the family is the human most difficult aspect. This is a good question… Let's say you sometimes think about it, but it's my job and I cannot be afraid, otherwise it's the end. We have years of training to deal with all this. Have you ever had to launch bombs? And how did you feel about it? Sure and that is not pleasant. But as I said before, we have long been trained to lower emotions to the minimum to stay focused on mission and orders. What do you do in your spare time when you are not in flight? My family is at home, this is my second family and it is very important to relax when we do not fly. So we're together to play cards or watch movies. Thanks again for your time and for answering to my questions. Thanks to you, it is a pleasure to have you aboard and have a female point of view. The Commander tightened my hands smiling. I thought that the life of a combat pilot must be full of internal contrasts divided between the cold heart required by the work and the sweetness for the family in free time. Along a wall there was a table full of pictures of their wives and children, all hung together with notes and messages. In the meantime the fighter pilots started entering the room to prepare the flight, no one wanted to be photographed, the risk to be exposed to the enemy is too high. We have blocked the passage to one of them, he was Iceman! I did not resist and I asked him permission to take a picture of the helmet. Then came a girl much younger than me who allowed me to take a couple of pics. She was a Super Hornet Weapon System Officer. At the end of the visit to the Blacklions we headed for the C-2 Greyhound, it was the time to go back home. The procedure was the same of previous flight: wear the helmet with eyeglasses and headphones, lifejacket and safety belt well pulled. This time we were not pushed to the back of our seat, but to the one facing us thanks to the push of the catapult! When we were in the launch position with the engines at maximum power, the vibration was very strong and I thought what the Super Hornet pilots feel right before the launch. As soon as the cabin crew made us the takeoff signal we was pushed forward by an impressive force! Just two seconds and everything was over. The sudden change of speed made me feel like being transited from a fighter jet to a glider. I think I will remember this adventure for the lifetime.